As Skelly Home grows, we are finally able to form a relationship with an organization in our community and help support the city who has always supported us. 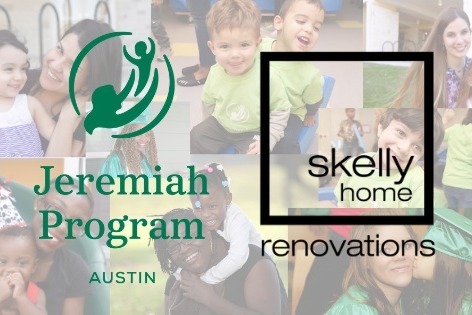 Skelly Home and The Jeremiah Program are now linked up to help promote the success of young females in the Austin area. The Jeremiah Program supports single mothers who are actively pursuing post-high school education by providing safe and affordable housing, early childhood education and childcare, empowerment guidance, life skills counseling, and a safe and supportive community. To kickstart our relationship together, I wanted to use my birthday to help draw attention to this beloved group. March 19 is my birthday (yay) and for the 30 days following my birthday, Skelly Home will be collecting donations for the Jeremiah Program (bigger YAY!). The Jeremiah Program is in need of both monetary donations as well as itemized donations for welcome baskets (used to greet new mothers as they enter the program). Through April 19, donations will be collected at our office. If you are interested in purchasing and donating an item, please see the request list on our latest blog post. Skelly Home will be donating five sets of Cuisinart non-stick pots & pans for new mothers. This is a common need of new mothers upon move-in, but can often not be provided due to cost. Reach out to Lily@skellyhome.com if you have any questions whatsoever! I envision Skelly Home and The Jeremiah Program sharing a relationship for many years to come. I’ve found myself even more passionate about our business growth then I was a couple months ago (which I didn’t think was possible), and if our success can help promote the success of young Austin mothers, then I know positively that all of our hard-work is paying off.